Airport Security Market size was estimated at over USD 9 billion in 2016 and is predicted to grow at 7% CAGR from 2017 to 2024. The increasing number of high profile terrorist and contraband smuggling activities across the world is a major factor driving the airport security market growth. Occurrences such as bombings, hijackings, and shoot-outs in high risk locations such as airports can lead to the loss of financial property and human life and the disruption of business for very long periods of time. Rising technological advancements in hacking software poses a high risk to existing airports that use legacy equipment for security checks leading to the high growth of airport security market. These systems lack the capability to identify and locate potential threats leading government bodies to initiate projects for modernization of airports. Airport databases are hubs for client information such as financial and personal data. The increasing reliance on the internet for operations such as data storage, tracking of cargo in real-time, and others can subject this information to security breaches and data theft. An increasing number of airports are providing free Wi-Fi hotspots to travellers. This is allowing external parties to hack into the security systems and disrupt day-to-day activities. For instance, the system can be hacked to allow the movement of illegal items weapons and cargo through the metal detections systems and baggage screeners, leading to a terrorist attack. The high installation and maintenance costs of the solutions is hindering the growth of the airport security market. The technology must be upgraded at frequent intervals of time as hacking software are continuously evolving at a rapid rate. For instance, the Petya ransomware, working similar to WannaCry, is disrupting the operations of airports and large companies in Russia and Ukraine causing the normal operations to be halted. The airport cybersecurity market is anticipated to dominate the revenue during the forecast time period. Cyber-attacks can be conducted from within the airport complex and from remote locations. Large airport that contain massive databases of critical customer financial and personal data are susceptible to these threats and are accounting to its high adoption. In July 2013, for instance, the hacking attack on the software of Istanbul Atatürk and Sabiha Gökçen airports, caused the passport control systems to shut down at the departure terminal lines, causing customers to miss flights and experience delays for approximately six hours. Perimeter security breaches across the world highlight the need for accurate, dependable security systems to protect aviation assets; leading to high penetration of this airport security market segment. A large number of airports utilize stringent screening and access management technology but do not take adequate measures to separate the public area from the Air Operations Area (AOA), making it easier for terrorists and unauthorized personnel to access a parked aircraft. Airport security market vendors offer technologies such as light and motion sensors, surveillance and thermal cameras, and video analytics systems that can enable airport authorities to enforce security protocols and deter outsiders from hijacking airplanes and stealing cargo. The increase in defense and security spending budget is driving the demand of the airport security market in Asia Pacific. Countries experiencing industrialization at a rapid rate, such as India and China, experience high passenger traffic per day. To reduce the inconvenience to travelers, governments in the region are increasingly embracing technologies such as biometrics and full body x-ray scanners that reduce the passenger wait times and speed up the security processes. Stringent government regulations to strengthen security at airports and aircraft hangars are anticipated to drive the airport security market in the U.S. The TSA is currently testing technologies such as Analogic's COBRA machines which does not require the passenger to remove their electronic equipment from their bags and provides an image of the bag and its inner contents. Furthermore, the increasing penetration of IoT and smart technology in airports is leading to a higher risk of cyber-attacks and security breaches. 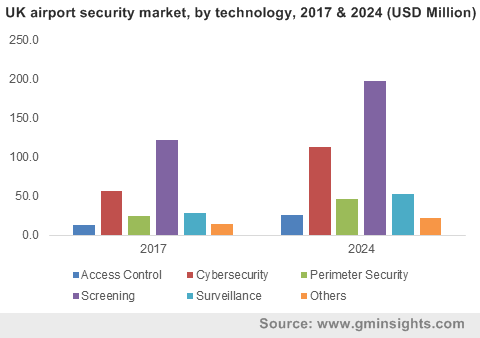 Rapid globalization and large-scale movement of people and goods across borders is contributing towards the growth of the airport security market. For instance, the Beijing Daxing International Airport is currently under construction and is anticipated to be functional by 2019. The airport will be ranging at 700,000-meter square and will house advanced security equipment and smart technologies. 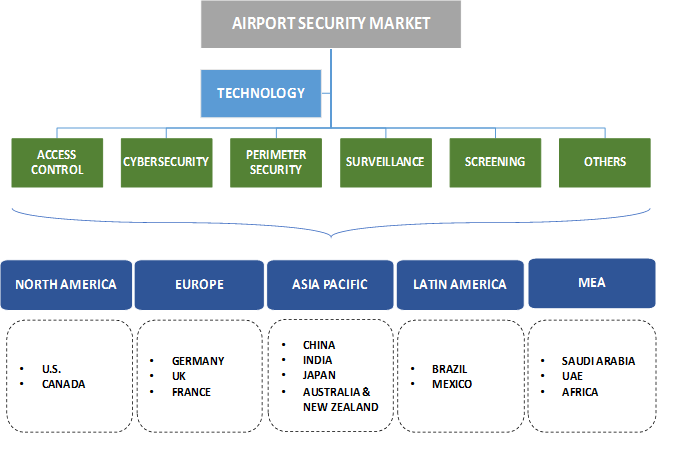 The vendors in the airport security market include Auto Clear LLC, G4S PLC, Fisher Research Laboratory, Lockheed Martin Corporation, Bosch Security Systems, Axis Communications, IBM Corporation, Siemens AG, Thales Group, Smiths Detection LLC, etc. The companies operating in the airport security market are required to invest heavily in R&D activities, such as the development of cloud security solutions, to sustain growth. As security threats are evolving at a rapid rate, the technology must be advanced at a faster rate to combat these threats. For instance, in 2017, Bosch Security Systems launched the Video Management System 7.5 software (BVMS 7.5) which allows security operators to have faster access to video footage while increasing the storage space allocated to these systems. Airport security market enables governments to ensure the safety of the travellers, infrastructure, and financial property while not hindering the travelling experience. The players provide a vast array of solutions that can be customized according to the requirements of the user such as size and financial budgets. This software can collect real-time user data, monitor user permissions, restrict and allow access to locations, and create a safer environment for officials and travellers. The Brussels airport shoot-out, in March 2016, led by two suicide bombers caused the death of thirty-two people and severe injuries of approximately three hundred civilians. In the aftermath of the incident, the Belgium government was accused of ignoring warnings about the suicide bombers and carrying out inadequate security measures. To combat such issues, governments of various economies, irrespective of their economic and financial strength, are adopting security solutions.